Board Members needed. The mission of The Medusa Project and The Medusa Cafe + Mercantile is to revitalize the rural village of Medusa, NY 12120 and the surrounding area by creating an arts audience. Also, we wish to connect an entire rural community to the art world with a vibrant public arts project. A café and gift shop will be key elements in establishing curb appeal and local interest. We want to create life-long art learners and a path forward by providing access, connectivity, and on-site education workshops. To enumerate: we will purchase a property on Main Street. A revitalization project will follow to develop and implement sustainable arts knowledge base.The exhibition space will beautify the village. Our goal is to create jobs and increase property values. The project’s larger mission is to make the art world accessible to a rural community. This new idea introduces a positive and creative energy to an economically challenged area. Furthermore, the Medusa Cafe + Mercantile will be a tourist attraction pulling shoppers with disposable income from Hudson, NYC, Boston, Albany , NJ etc. An arts experience will become as regular to local residents as farm chores. So, milk a cow, then take a free 4×5 polaroid class at the Art Space. That’s our idea. By the same token, workshops will be free to residents. Exhibiting artists will give a collaborative talk and demonstration about their work on Saturday mornings.A public gallery space is planned. Rotating disciplines will be invited to install a public series. Every resident is offered free arts programming. Also, with each art show mounted, a fine art piece is donated by a participating artist and raffled off at the end of the exhibit. A gift from artist to town. We counter the idea that creating, collecting or looking at art is only for those with privilege. Artists selected by The Medusa Project will, ideally, be awarded a stipend. However, if we are unable to secure funding for this aspect of the project, we will inform artists to apply for their own opportunity based grants. Exhibit themes are currently invitation only. However we plan to open up a application process by committee. A budget of funding is available upon request. 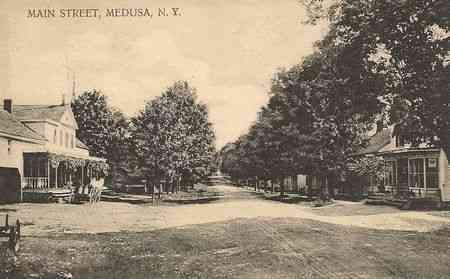 Vintage photo of Main Street in Medusa, NY.